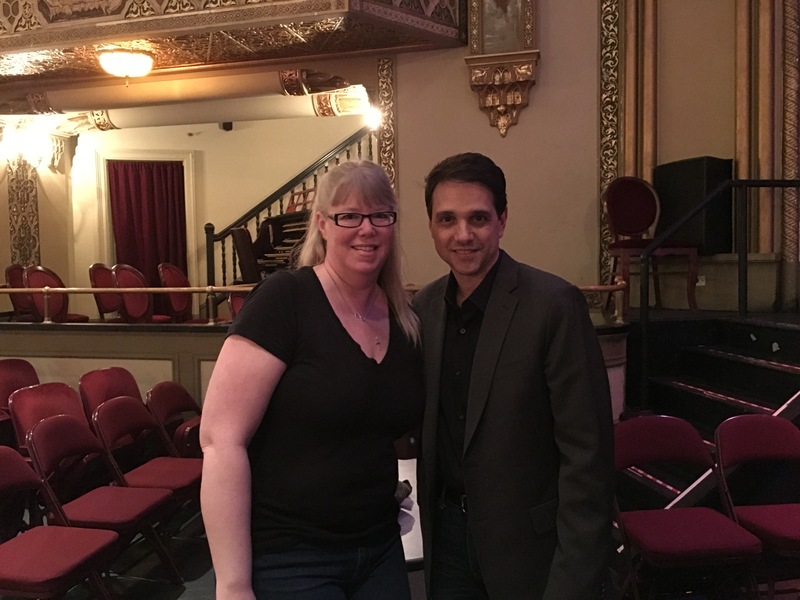 Home » Movies and TV » After 33 years I finally met RALPH MACCHIO!!! They say how you spend your New Year’s Eve is how you’ll spend the rest of your year. Well I spent New Year’s Eve watching The Karate Kid trilogy, and this past Saturday I met Ralph Macchio!!! Before there was Brady Anderson, before there was Larry Mullen Jr, there was Ralph Macchio. I have loved him and wanted to meet him for 33 years since I first saw him in The Outsiders (still one of my top 5 favorite movies) in 1983 when I was 11 – and that’s exactly what I told him when I met him. He just kept looking me in the eye and saying “Thank you. I really appreciate that. Thanks for coming out.” Even as I walking away, he was thanking me. He couldn’t have been nicer. The lady who was taking our picture was taking a really long time, and Ralph said to me “Wow we could have made a movie in the time that took.” Surreal! I met, shook hands with, talked to and got my picture taken with Ralph Macchio aka Johnny Cade aka Daniel Larusso! Ah, I still can’t believe it! That fateful Saturday night all started when I saw a post on facebook Ralph shared right before I left work on Thursday. It said there was going to be a screening of The Karate Kid (one of my top five favorite movies of all time) and a Q and A with Ralph Macchio after. And this was to take place in Reading, Pennsylvania, which is only two hours from me. So I immediately went to the site to buy a ticket. There was one ticket left in the front row (front row center) and that ticket came with a Meet and Greet with Ralph. I was over the top excited, didn’t think too much about the drive or the cost and just bought the $150 ticket. That night I took to twitter and asked Ralph when the Meet and Greet was. To my surprise, he tweeted me back and told me it was after the QnA. I squealed like a teenager! Saturday I left my house at 4:30 and was in Reading, Pennsylvania by 6:30. After driving around for almost a half hour trying to find a parking space, I was inside the Santander Performing Arts Center. The screening of The Karate Kid was from 7:30 to 9:30. The Q and A immediately followed and went until just after 10:30. It was so great, and I was SO close! Ralph entertained us with all of his stories from making The Karate Kid. Ralph said the first scene of Karate Kid 2 (in the parking lot) was supposed to be the last scene in the original but Daniel winning the tournament was just too great of a high not to end the movie there. Ralph said the song “You’re the Best Around” (during the tournament sequence) was actually a leftover song from Rocky – both Rocky and The Karate Kid were directed by John Avildsen. Ralph did all of his own stunts and fight scenes except two: the one where he’s tumbling down the hill after falling off his bicycle and when he jumped over the car running from the Kobra Kais after the Halloween Dance. At the end of that scene (at the fence by his apartment building), Billy Zabka (Johnny) actually hit Ralph in the face by accident of course. Ralph mentioned the terrible clothes he wore in the film, which I had always commented on especially the checkered shirt tucked into the camouflage pants. Ralph talked about how originally no one wanted Pat Morita (Arnold from my favorite tv show of all-time Happy Days) for Mr. Miyagi, and both Charlie Sheen and Robert Downey Jr. also auditioned for the role of Daniel Larusso. Ralph said one of his favorite lines in The Karate Kid was in the birthday scene, he’s sitting in the car Mr. Miyagi just gave him and Daniel looks up and says to him, “You’re the best friend I ever had.” That has always been my favorite line too! When asked what his favorite professional moment was, he answered making The Outsiders (and acting with Robert De Niro on Broadway). It was an unbelievable night! A 33 year dream come true. I finally met Ralph Macchio, who stars in two of my favorite five movies of all-time! To learn more about my love for The Outsiders, please click here, and for The Karate Kid, please click here. 4 Comments on After 33 years I finally met RALPH MACCHIO!!! Did you see him when he appeared in Ugly Betty?? Great reading about your exciting night! i did. i try to see everything he is in! thanks for reading and commenting!